IN the heart of Panama City the beautiful Nuestra Senora del Carmen church was packed with young Australians celebrating morning prayer. 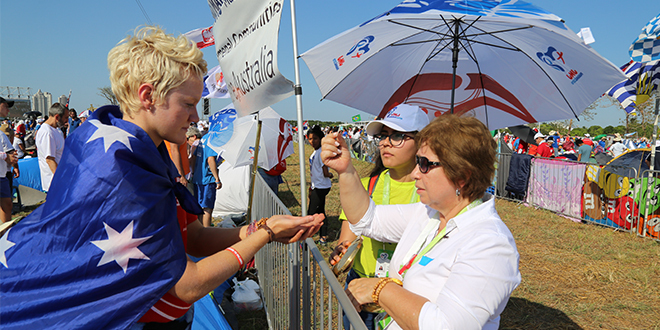 Just by chance Bishop Michael McKenna of Bathurst, one of several Australian bishops in Panama for World Youth Day, passed the church and agreed to introduce prayers to about 250 visiting youth from Australia. Bishop McKenna’s message was strong on a day that was a double celebration – World Youth Day and Australia Day. “God is not distant, God is not an executive or a dictator, God is love and calls us into the flock,” Bishop McKenna told pilgrims. A few hours later with the dark clouds forming across the tropical sky, the pilgrims were marching from downtown Panama City to the John Paul II field to meet Pope Francis. The heat and humidity was stifling, but it didn’t weaken the verve of the young Aussies who had spent the past week on a pilgrimage through Mexico and Costa Rica to get here. The Aussie chant went out as thousands of pilgrims from around the world – but particularly the Americas – started to merge near the entrance to the massive open fields. WYD19 had all the trappings of a major pop concert – big screens, ear-splitting music and thousands of port-a-loos that stretched into the sunset. It was dusk and finally the roar went up as Pope Francis arrived and completed a circuit of the field by popemobile, before taking the stage. The roar was enormous, and his message was on song for the young crowd, who had every reason to question the meaning of their fast-paced lives. Life, Pope Francis said, was not “a salvation up ‘in the cloud’, and waiting to be downloaded, a new ‘app’ to be discovered, or a technique of mental self-improvement”, he said. It was not a “tutorial” for the latest news either. “The salvation the Lord offers us is an invitation to be part of a love story interwoven with our personal stories; it is alive and wants to be born in our midst so that we can bear fruit just as we are, wherever we are and with everyone all around us,” Pope Francis said. Part of his speech was a response to the witness shared by several people during the vigil, that included prayer and singing, and closed with Eucharistic adoration. A married couple with four children – Erika and Rogelio – spoke about how less than three years ago, when she was in her 40s, they found out they were pregnant, and it was labelled high risk. On week 17 they learned that their baby girl, Inés, had Down Syndrome and the doctors advised them to get an abortion. Instead, they decided to go forth with the pregnancy and “abandon ourselves in the hands of God”. During his remarks, Pope Francis thanked the couple for their “yes” – for choosing to love their daughter with all their hearts. “You believed that the world is not only for the strong,” the Pope said. Saying “yes” to God meant being ready to embrace life as it came, even with its fragility, simplicity and its conflicts and annoyances. “It means embracing our country, our families and our friends as they are, with all their weak points and their flaws,” the Pontiff told an applauding crowd. While many WYD participants bedded down in sleeping bags, thousands partied for most of the night. The main stage provided high-volume band music, but spontaneous singing and dancing could be witnessed everywhere. At 6am, an ear-splitting wakeup call from the hosts on stage, followed by a callisthenics session, still proved only a warm-up for Pope Francis’ closing morning Mass homily. “Dear young people, you are not the future but the now of God, and he invites you and calls you in your communities and cities to go out and find your grandparents and elders; to stand up and, with them, to speak out and realise the dream that the Lord has dreamed for you,” he said. He urged young people from all continents to “realise that you have a mission and to fall in love; that will decide everything”. Pope Francis reminded the young, “we may possess everything, but if we lack the passion of love, we will have nothing”.